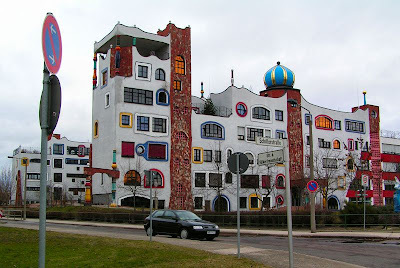 It's the Luther-Melancthon-Gymnasium (High School), designed by architect Friedensreich Hundertwasser. It's an amazing combination of bright colors, Dr. Seuss-like shapes, and trees growing on the roof. And while it doesn't explicitly have anything to do with the fantastic, I found the building to be magical. A few weeks ago, I wrote about finding the possibility of the fantastic in everyday life, and I think that the work of Hundertwasser appeals to me for similar reasons. The unexpected appearance of bright colors and crazy shapes, particularly in places that are very industrial-looking and gray, suggests the possibility of the fantastic, since what, other than magic, could have brought in such vibrant, out-of-place architecture. 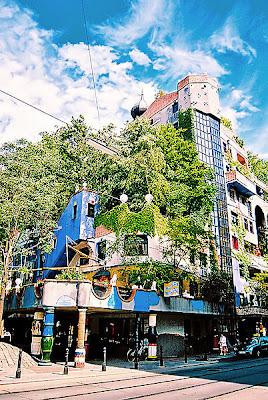 It turns out that Hundertwasser was dedicated to bringing life to places that he thought were ugly; in several speeches he gave, he argued that conventional architecture was a sterile grid that imprisoned people. The website for the Hundertwasser House (pictured below) explains Hundertwasser's philosophy in greater detail: "Die Geradlinigkeiten und die Uniformität der Bauhausarchitektur gehen ihrem Ende entgegen, denn sie ist gefühllos, steril, kalt, herzlos, aggressiv und emotionslos," which, loosely translated, reads, "The straight lines and uniformity of the Bauhaus architectural style go against their own ends, because this architecture is without feeling, sterile, cold, heartless, aggressive, and without emotion." The real magic of this building comes from the contrast between the function of the power plant and the whimsy of the building. It's a contrast the suggests potential, possibility, and creativity--the very best parts of the fantastic. Mid-World Enterprises, LLC 2011 CC BY-NC-ND. Simple theme. Powered by Blogger.